Synopsis (from Goodreads): The God of Chaos is marching. The Borderlands is nearly overrun, shredded by his army. In a dusty village, ninety-four residents led by two soldiers make a last stand. During the assault, one of the enemy isolates Rhohn Lurus, a Dust Man. Yet rather than kill him, the monster gives him a cryptic message and begs he carry it east, claiming it could halt the war. At Storm Island, Nikalys, Kenders, and Jak are adjusting to their new lives as leader, mage, and soldier. In the nation’s capital, nobles spar, some conspiring with the enemy while others ally together to halt Chaos’ advance. New friends will be made, old rivals rediscovered, and secrets revealed. The stage is set. War is here. And the Progeny must stop it. Yet another spellbinding installment from someone who is slowly becoming one of my favored authors, R.T. Kaelin! In case you missed it, I did a review on his first book in the series, Progeny, plus an interview. You can see the review here and the interview here. Be sure to check them out! The more I delve into this series, the more I feel like I'm reading a contemporary rendering of Lord of the Rings. This book didn't quite move at the same pace as Progeny, but I did really enjoy seeing the characters grow. Kaelin's style of writing is like a breath of fresh air every time; smooth and detailed. He clearly thinks through his characters, settings, and storyline rather than simply scratching the surface. 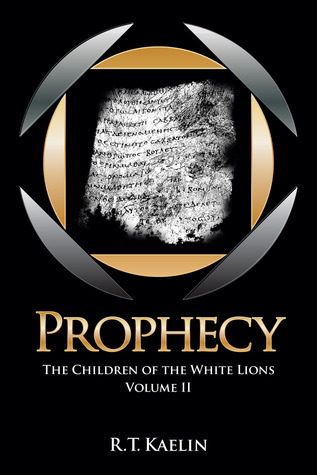 Like previously stated, Prophecy moved a bit slower for me (as 'middle' books of a series usually do). I love that Kaelin has developed a world of his own with many different species and mythology. However, there was a point that became a little overwhelming. Thank his gods in the back of the books for those references, because without them I would have gotten very lost! That being said, I would advise readers to look those over before starting the first page, they are very helpful and actually interesting to read. The things I really enjoyed about this installment: The character development. Nikalys, Kenders, and Jak are all having to face situations that call for a certain maturity that is still coming to surface for them. Here we get to watch them grow. We discover there is a prophecy that gives us a glimpse of the future, setting the stage for the rest of the series. We are also introduced to more characters, which, as long as you keep up with it, is an extra feat to the work. Although at times it was a little harder to get through the extreme detail in this book, I'm finding myself falling in love with this series. One day, when it's finished in its entirety and is available as a set, I'll be one of the first to get it for my bookshelf. I recommend it to anyone who enjoys Lord of the Rings or Eragon. I've even been pushing for my husband to read these novels because I think he'd really like them, too. As always, I'm looking forward to book 3 to see what happens with our beloved heroes and the future of the Oaken Dutchies. Also, be sure to grab your copies of The Terrene Chronicles that accompany this series (I actually still need to read these...)!